Solar Panels – more energy production less energy bills. 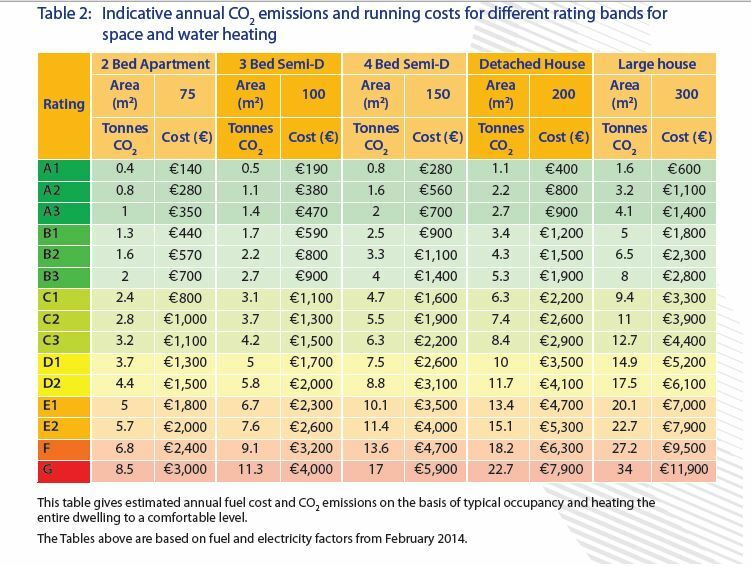 SEAI have recently released figures on the running costs and CO2 emissions on heating systems related to houses with different BER ratings. The obvious conclusion was that the more energy efficient your house is the less it costs and pollutes. The difference in heating energy use between the least energy efficient house, a G rating and a hosue with an A rating is almost 10 fold! That is you spend 10 times more money on your energy in a G rated house than you do in a A rated house. 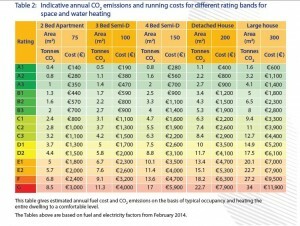 To be even more specific if you have an A rated 4 bed house you are likely to spend in the region of €500 per year to heat your house and hot water, a G rated house will require €5000!! Solar panels are an easy way to start to reduce this cost. To improve your BER there are two easy steps – Insulate then generate. First you need to insulate your house so you stop losing and wasting heat, insulate your attic, walls and floors if you can and upgrade yours external doors and windows. At the same time you need to consider generating your own energy. Solar Panels are brilliant for this. They are easy to put in and can be installed on any building – it’s this flexibility that makes solar panels so friendly to use. What can solar panels do for me? Solar panels can provide heat and electricity but there are different types of solar panel for each energy source. Solar panels for heating water (or solar thermal panels) produce hot water for washing and cleaning typically. Some try to use solar panels to produce space heating but I can never justify the cost for this when heat pumps and insulation provide better returns.. That’s not to say that solar panels don’t work in the winter – they do, but to a lesser degree so they need to work in tandem with another heat source to ensure continuity of supply, a grand system but can be expensive and can take up valuable south facing roof space that can be put to work with solar panels for generating electricity. Solar PV (photovoltaic) panels produce electricity where solar panels for hot water produce heat. Solar PV is really useful to provide base load electricity during the day so if you have a constant demand for electricity during the day or work from home etc.. Solar panels for producing electricity are an easy way to save money in the long run. Installing solar panels for heating water will improve you BER by one step typically. Solar PV panels can increase your BER dramatically depending on the size of solar panels array you install. There is a two pronged financial benefit to this, first the panels will save you money directly as they replace energy that you would normally have to buy. Secondly an increased BER rating increases the value of your property far exceeding the cost of the investment to install – a great idea if you are looking to sell.